Stability System for Tending Machines Modern Machine Shop 77 LEFT: UMN President Cathy Sitek is proud of her manufacturing heritage. Her father ran a job shop, and she feels a kinship with the many other female manufacturers in America's past. shop owner Cathy Sitek explains, smiling at a bright yellow Rosie the Riveter poster with black-marker signatures. One of the grinding machines in her shop, which served on a World War II battleship, very well may have been built by Rosies, she says. This thrills Ms. Sitek, an energetic woman with 35 years of grinding experience whose business is based on her skill and experience using decades-old preci- sion machines. She prides herself on being an old-school machinist, but at the foot of every one of the machines in her shop is something new, the solution she now calls the "Standrite-Pro." Ms. Sitek grew up around machinists. Her father owned and ran a job shop, and he thought experience in the shop would help her find a path forward. "When I started working on the grinding machines, everything just made sense," she says, and she never looked back. "My dad told me that if I wanted to own my own shop, I needed to learn how to run every machine, and that was fine with me." Eventually, Ms. Sitek did manage her own company. As the owner of United Gage, she manufactured precision gages for many years. Looking for a more profitable venture, she founded UMN as a distributor for machine tools, but in 2009 she had to shift gears as the recession struck. She purchased an aging jig grinder and placed a sign outside her building. She was able to repair the grinder and achieve tolerances as tight as 0.0001 inch. She slowly built up work, keeping the lights on but not making a significant profit. However, the profit margins improved when she married her husband Jerry Sitek. Formerly a manager at a construction firm, Mr. Sitek is an experienced business manager. "We thought that if I handled the business side of things, and she took care of the machining, it would be a lot more profit- able," he says. The business purchased five more grinding machines and refurbished them to tight precision. However, as the number of orders increased, the company soon ran into trouble. "We were expecting to hire help as we grew to take the burden off Cathy," Mr. Sitek says. "But machine to lean slightly while standing, dramat- ically changing the forces on the body and elimi- nating the knee locking that has proved to be the source of her pain. Grinding Metal for Fun and Profit Walking into United Manufacturing Network, a small precision-grinding shop in Warren, Michigan, one immediately sees original World War II posters showing women at work. "This one was signed by the last surviving Rosies," Ms. Sitek has 35 years of grinding experience on machines such as this Harig surface grinder, but she was not willing to endure chronic pain to work. 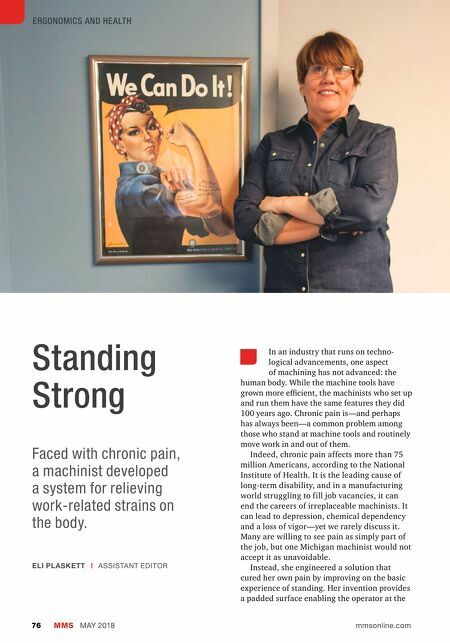 To overcome her pain, she invented and installed the Standrite-Pro on every machine in the shop.